Lap/shoulder belts for people who sit on the outboard sides of the rear seat. A lap belt for people who sit in the center of the rear seat. 2. Slowly pull the lap/shoulder belt out. 3. Insert the tongue plate into the open end of the buckle until an audible “click’’ is heard, indicating the belt is locked in the buckle. 4. 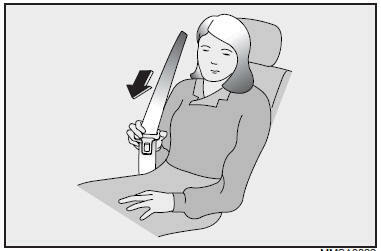 Position the lap portion of the belt across your lap as LOW ON THE HIPS as possible to reduce the risk of sliding under it during an accident. Adjust the belt to a SNUG FIT by pulling up on the shoulder portion of the safety belt. The belt retractor is designed to take up excess webbing automatically and to maintain tension on the belt. This is for your safety. Do not put excess slack into the safety belt. Press the button on the buckle and allow the belt to slowly retract. Never wear the shoulder portion of the safety belt under the outside arm or behind the back. Never wear the shoulder portion of the safety belt across the neck or face. Wear the lap portion of the safety belt as low as possible. 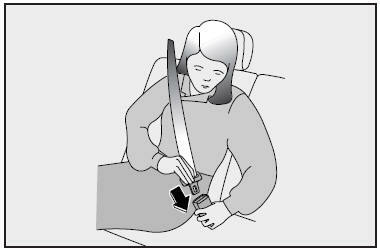 Be sure the lap belt fits snugly around the hips. Never wear the lap belt over your waist. Make sure the safety belts are not twisted while in use. Never use a single belt to restrain more than one person at a time. Failure to follow these warnings could increase the chance and severity of injury in an accident.